Heidi Klum has designed an official US Open t-shirt to be sold at the 2008 US Open. The limited edition Heidi Klum t-shirt is part of the USTA’s wide-ranging green initiatives at the 2008 US Open and will be sold at the Octagon, the US Open store located in Louis Armstrong Stadium, on USOpen.org and at US Open SoHo. The design will be printed on a 100% organic cotton t-shirt. Organic cotton is grown using methods and materials that have a low impact on the environment. Klum – who, along with husband Seal, is an avid tennis fan -- used her children’s crayons to sketch colorful butterflies, turning the body of each butterfly into a tennis ball. Instead of designing hard lines or using digital art, she made her designs feel organic and home-made, leaving her scraggly lines. 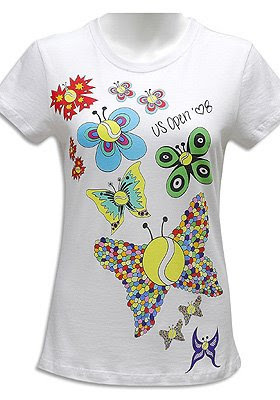 Once the butterflies were complete, the creative team at the USTA took the 11 versions of butterflies Heidi drew and placed them into Heidi’s intricate template. The front of the t-shirt was later polished off with Heidi’s handwritten “US Open 08,” using a heart in place of the zero. The use of a drawn heart is a trademark element of Heidi’s signature. “I think it’s important to keep our environment healthy and I really believe everyone, even in small ways, can take a proactive approach to keep the environment in the best shape possible,” said Heidi Klum, supermodel, executive producer and host of Bravo’s series Project Runway. A portion of the profits from the Klum t-shirt will benefit Unisphere, Inc., the non-profit organization that maintains and preserves Flushing Meadows Corona Park, home of the USTA Billie Jean King National Tennis Center.